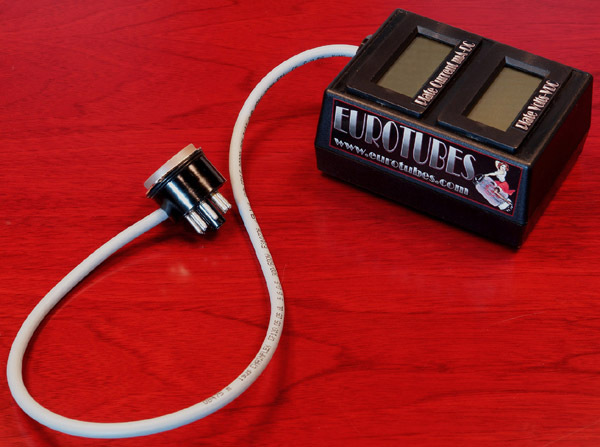 The ET "Pro One” Bias Probe is an "all in one” bias probe for octal tubes including 6V6's, 6L6's, KT66's, EL34's, E34L's, KT77's, 6CA7's, 6550's and KT88's. It is unique in the fact that it shows you both the plate current and plate voltage simultaneously and it is completely self-contained with no switches, knobs or batteries. The "Pro One” Bias Probe will read out the plate current in the upper readout and the DC plate voltage in the lower readout. Unlike other bias probes the "Pro One” Bias Probe is designed to allow you to play the amp while the probe is installed. So adjust, play, adjust and dial your amp in!